Pictured from in the first shot is Mariya, the Project 365 accommodation house Manager, with Srey Py and Phara from our Village in Kandal province. 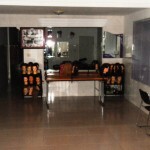 As at 2017 no students are wanting placement in a Hairdressing Apprenticeship, and unfortunately the owners of the building we were renting for this have discontinued our lease. 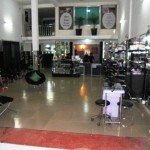 Therefore the Committee have decided to end the Hairdressing project indefinitely. 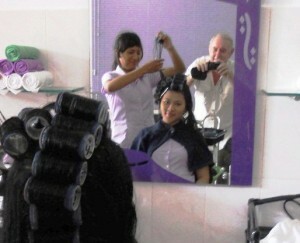 We have placed Srey Py (20) and Phara (17) with “Open Arms” for a twelve month Hairdressing and Beauty apprenticeship. Our girls will be given a hairdressing and Beauty Kit each for a seperate cost of around US$500 each, this provides all the necessary tools, solutions, dyes etc. The cost of the course is approximately US$250 for each girl not including the kits, this does not include the accommodation or food. This is all being sponsored by the Narrabeen Community Australia. At the end of the course these girls will be highly skilled and should be able to start their own business, again with help from CHOICE. They are living nearby at our “Project 365” accommodation center in Phnom Penh. We have provided them with bicycles, bedding, fans backpacks etc. they will also study English. We take them home at least once a month to visit their family. Open Arms is a registered NGO in Cambodia and run by Australian founders Sandra & Grahame Wade. They also run courses in Housekeeping and Cooking. Open arms is an organisation that trains underprivileged and rescued young Cambodian people with practical skills, in a loving and caring environment. 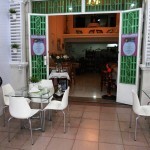 Open Arms is beautifully set up with a Hairdressing Salon, Training Salon and The Haven Tea Room that serves food, drinks and home made cakes, if your in Phnom Penh you should drop by to sample their goodies.